Inspired by saké, Chef Jeff and the team are bringing you an exclusive 5-course Saké Pairing Dinner on June 22nd. To wet your appetite for discovery, we asked Chef to share a few thoughts on the dinner. Q: Basil chive flowers aren’t something that you see on a menu every day, what made you select them as a component of the first course? Basil chive flowers have a lite citrus flavor that helps balance out the natural flavors of the Sardine. Q: Instead of a dessert, you elected to introduce an Intermezzo after the second course, why? The first two courses are both really rich and full of umami flavors. The team just felt like we needed t have a palate reset before we took the dinner down the home stretch. Q: In the third course you’re using a sous vide protein, is this common in Japanese Cuisine? Although Japanese cuisine is known for sushi, there are many different styles and methods to the cuisine. Chef’s share techniques, flavor profiles, cooking methods, and ingredients, and sous vide is one of those timeless processes that great chefs have been using (regardless of cuisine type) forever. It’s definitely a process that we like to use here at Dragonfly. Q: Loch Duart Salmon in the third, Wagy beef in the fourth, and king crab in the fifth, it looks like the team really pulled out all the stops for this Saké Pairing Dinner. What was your motivation? The motivation was really 3-fold. Primarily, we want to continue to push the boundaries of our food and drink programs. To continue to provide something to Gainesville’s food scene that’s different and delicious. This embrace of Kaizen (continual improvement) helps us inspire our staff—and our guests— to think about food in new ways. And finally, we wanted to pay homage to the versatility of Sake. 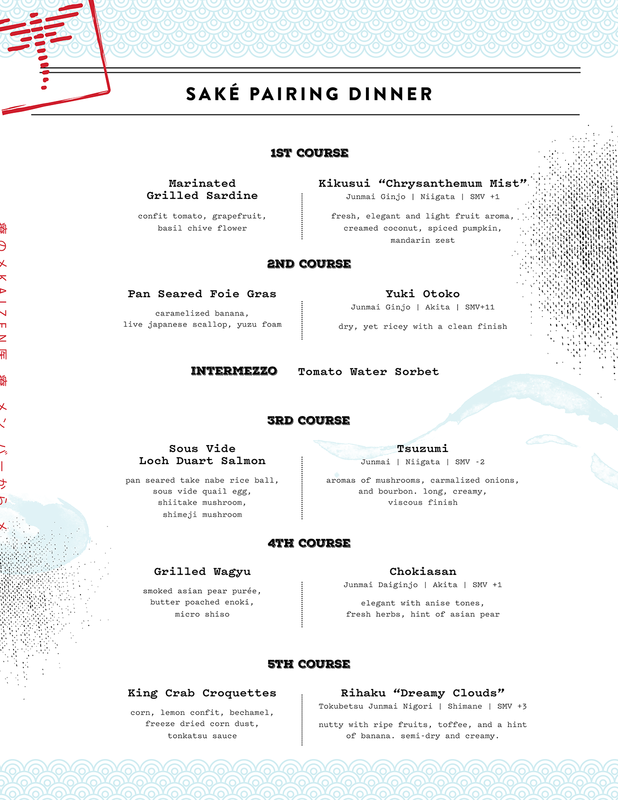 With only 20 seats available and all-inclusive pricing at $130pp, our 5-Course Saké Pairing Dinner is going to fill up very fast. Call us at (352) 371.3359 to reserve your seats today!